There have been some who have suggested that this album is where Tintin is finally developed, though as I have suggested, I consider that album to be [book:the Cigars of the Pharaoh]. This album though develops a number of elements that are going in reappear in later albums, the most important being the country of Syldavia, as well as introducing the Milanese Nightingale, Bianca Castafiore. Syldavia is a fictional country that Herge developed, and I suspect that it was so that he could move away from the criticism doesn't truly understanding other cultures. As such, the best way to escape from that is to develop a culture all of your own. Syldavia is basically a small monarchy located somewhere in the Balkans and borders the country of Borovia, which is a military dictatorship. This album actually has a three page spread, as well as beautifully drawn pictures, of this country that Herge created. I originally believed that Syldavia and Borovia were supposed to represent Eastern and Western Europe, however having noted that this album was completed in 1939, before Europe was split between the Eastern and Western block, I suspect that there is a little more to it. Obviously, being Belgium, Herge could have been using the two countries to represent the Third Reich and the rest of Europe, with Syldavia being your average small European nation. It is also noticeable that the portrayal of Borovia is nowhere near as extensive as that of Syldavia. This album is contains a lot of political intrigue. The story is that the king of Syldavia has a sceptre, called King Ottokar's Sceptre, which must remain in his possession. It is suggested that if he is not able to produce the sceptre on St Vladmir's Day then he must abdicate the throne. As can be expected, there are a number of elements that seek to remove the king from the throne, most particularly Borovia. I note that the intrigue includes starting riots that target Borovian interest to give them an excuse to invade. This album was completed on the eve of World War II. Hitler had already added Austria and Czechoslovakia to his empire, and was now eyeing off Poland. There was a lot of intrigue in Europe at this time as the various countries began to shift the alliance towards the coming conflict. Already Italy and Romania had joined the German camp, and Russia had made it clear that they were not interfering. Similar intrigue happened prior to World War I, in particular with the spies that were travelling between the belligerents, and I suspect that the same was happening here. This was probably the first Tintin album that I ever read as a kid, though it does not rank as high as some of the other ones. 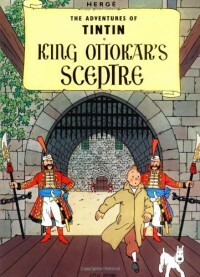 It is still quite entertaining, and very amusing when Tintin first encounters the Milanese Nightingale.